In 2006 the congregation of the Methodist Church decided to renovate the building. The Foundation stone had been laid on 13 August 1879 and was badly weathered and almost illegible, so the entire stone was removed in order to put a new sandstone facing on it, and renew the inscription. The Foundation stone was hollow, and in the hollow was a small tin box. 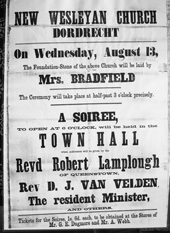 In the tin box was a collection of documents: a copy of a Wesleyan magazine titled "Missionary Notices", an advertisement for the laying of the foundation stone, a complete Cape of Good Hope Government Gazette, two pages from Dordrecht's own newspaper The Frontier Guardian, and a handwritten page describing the status of the church at that time. In the Dordrecht and Stormberg circuit, it said, there were 33 members of the church: 24 "English", and nine "Native". The English were served by two ministers or preachers, Philip Tearle and Ambrose Webb, and the Natives by three: Isaac Gaba, Filani September, and John Bokwe. Also in the tin was a handful of coins: a shilling, a sixpence, a tickey, a penny, a ha'penny (with a hole knocked through it) and a farthing. The original documents and the coins were replaced back in the foundation stone – along with a photograph of the congregation. Copies of the original documents were however made and these have recently been presented to the Anderson Museum in Dordrecht. Text adapted from Facebook post on 23 October 2017 by Ben Maclennan in the Facebook page of the Anderson Museum in Dordrecht.